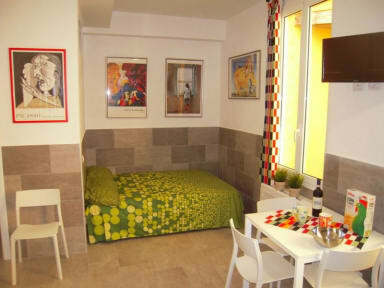 Lovely and bright studio located on the first floor of an ancient building. Completely renovated in 2016. It is ideal for a couple with kids. It has a cooking area, a double bed, a double sofa bed and a bathroom with all comforts (toilet, bidet and shower). 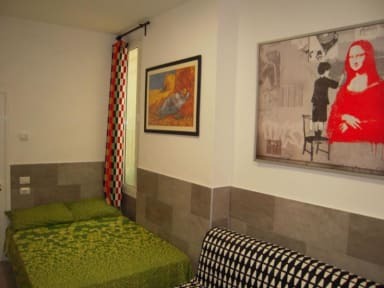 The studio is located in “Nazario Sauro” street, in the hearth of the historic city center, at few meters from 2 Towers and main square. In a wonderful ancient street full of movida. A street well served by public transports (the bus stop is near the house), from which you can reach the central station (also on foot in 10min) and the airport. Nearby there are several typical restaurants, supermarkets, pharmacy and a laundromat.